And a wonderful viewpoint it is! That castle looks so majestic and I like the fountain a lot. This must be a popular spot in Lisbon! I like the beautiful fountain ! i could just sit here and look at this photo for a while! What a fantastic view and a beautifully composed photo. 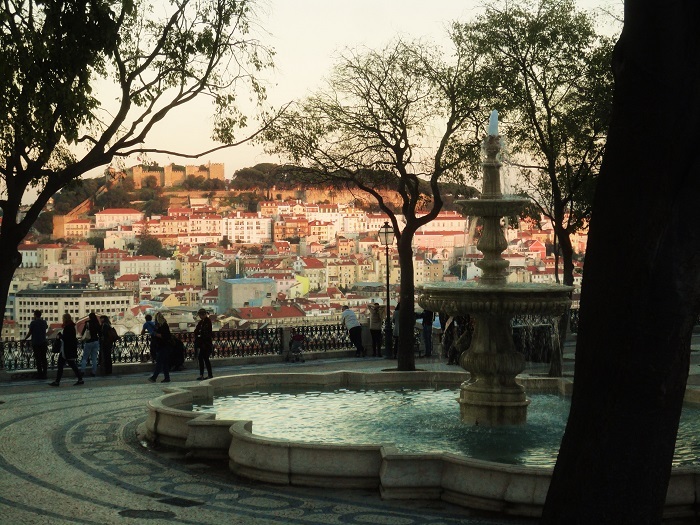 One of the many beautiful spots in Lisbon Jose, don't you agree? What is it about us that we all absolutely adore seeing the Mediterranean views of houses on the hillside? Just spectacular! It is an attractive scene, José. Such a lovely place and a terrific capture, as always!! I hope you have a wonderful weekend, Jose!! Enjoy!! I'll probably never get there, so I'm doubly glad your pictures put me there. Good stuff! My immediate thought on seeing this was that line from The Wizard Of Oz: Toto, I don't think we're in Kansas any more. I'll be in Kansas next week, though. No scenes like this. great view ;) Sorry José i deleted your last comment by mistake ! What a lovely place to walk Jose, stunning background.